It was a great day almost glitch free except RoxAnna couldn’t find where she put the pitchers for making tea and lemonade and had to go buy plastic at the local dollar store. Of course, as soon as she did that she found the missing pitchers. Sandy led a fantastic Riverwalk and got everybody back in plenty of time for the cavern tour. The Grand Caverns’ staff was wonderful: accommodating and supportive at every turn. Members and family of members who came appreciated the tour. Judy brought husband Leo, Teresa brought daughter Serena; Sue brought husband Mark and RoxAnna’s husband Bill rode in on his Honda Magnum just in time for chow down. Kate stayed a bit after the Riverwalk to work with Adrie, Dwayne and Pat on identification and keying skills. Ann Cline found cicada killers in the lawn (thanks to Dwayne we all now know what they look like and what they do) and took some great photos of them. As he always does, Tom Long took some photos of the cavern tour and while that was in progress Pat and Dwayne helped RoxAnna set up for the return of the Cave Crawlers and the evening Pot Luck. Paul Bugas came by and was put to work at the Grill. He was a wonderful Grill Master even though the coals were not cooperating. We will have to remember to start the coals sooner next time. Dwayne put together the flower arrangements for each table while RoxAnna mixed the teas and fresh squeezed lemonade and Pat finished the bulk of the food prep just in time for the return of the rest of the group. Everyone enjoyed the beverages and Jerry’s chips and dip while Paul crooned to the charcoal to get them hot. 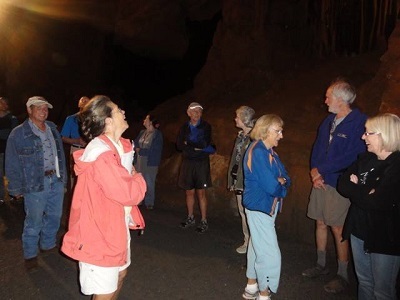 After some additional food prep by members who had been on the cave tour, all was ready and we dug in to some wonderful dishes and sat down to socialize and get to know each other better. Ann Cline took some photos of the group at chow down and all seemed to enjoy the meal and each other. Stephanie brought some beautiful heirloom tomatoes. Teresa experimented on the group with a new dessert combo. RoxAnna focused on Dwayne’s cookies – who tried the other desserts? Those who finished first (thank you Chip, Rob and Carl) lent a hand to set up the presentation support. Sandy and Gretchen were the first to receive the new Headwaters appreciation gifts: 2014 Gatewood Calendars made especially for the Chapter by our own Betty Gatewood. Everybody signed the calendars and the Fall Wildflower book given to RoxAnna –sometimes signing Gretchen’s calendar for Sandy and Sandy’s calendar for Gretchen – so it was a very memorable effort. Just as Gretchen was about to start her presentation on bats Mother Nature made her entrance and about half way through a very close (if not direct) lightening strike postponed the talk for about fifteen or twenty minutes until the bulk of the storm passed. 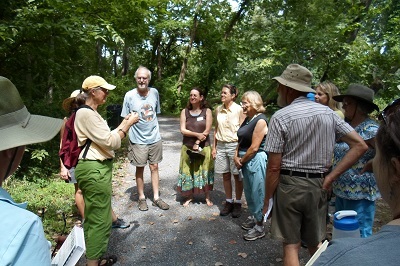 Gretchen finished her excellent presentation while Judy and Ann Murray took copious notes and we had lively Q&A session before cleanup and pack up. Some of our new trainees have already been mentioned but we thank them for joining us for the day and/or evening. Bob Forrest came with wife Betty (one of our Charter members) and did a book review on the spot for a potential training text. Kendal Swartzentruber (I did that without looking! ), Ginny Hoffman, Sue Eckroth and Janet James (who became a prospective trainee that very night) graced us with their presence. Thank you Sue and Ginny for helping lug the food support. Each and every person pitched in at some point during the day and the group team effort made the event a spectacular success. But the clean up team were the best – smart enough to ignore RoxAnna’s claim that she could do it alone, they made it all happen as Bill packed up the Prius V while Janet and Gretchen packed up Gretchen’s van. Sandy took home all the dishes and linen to be washed and Gretchen followed RoxAnna home with her loaded van. We all loved every minute of it! October 25, 2013 in Field Trips.